Warren's goal is to teach the horse to be patient, accept leadership, and to respect and trust the rider. Training requires regular, consistent exercises, including ground work each time the horse is getting ready to be ridden. The training focuses on developing and maintaining feel, timing and balance. The ultimate goal is to teach the horses to be patient, accept leadership, and to respect and trust the rider. If you are interested in Western Trail Horses Training program, please contact us. 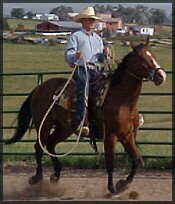 The horsemanship and communication training philosophy and methods that Warren uses are adapted from Bill and Tom Dorrance, Ray Hunt, Pat Parelli, John Lyons, Dennis Reis, Clinton Anderson, Curt Pate, and Marty Marten. The training facility located near Sterling, Colorado has an indoor arena, round pens and runs for up to 20 horses at a time. The clean, neat, safe pens and facility are an ideal place for year round training. The average time for a horse to be at the training center is two months. During that time, the owner is encouraged to visit to learn what techniques are being used and ride the horse under Warren's direction.